Why not consider pairing a white fur jacket with black skinny jeans? As well as totally comfy, these two pieces look cool when worn together. 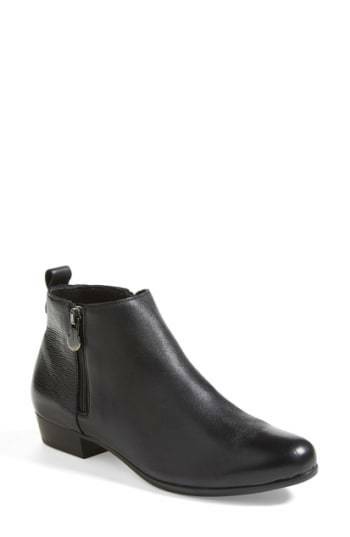 A pair of black leather ankle boots is a wonderful idea to finish your outfit. This is hard proof that a black double breasted blazer and black leggings look awesome when you pair them up in a casual getup. Black leather ankle boots introduce a refined aesthetic to the ensemble. This combination of a black mohair short sleeve sweater and black vertical striped leggings is super versatile and apt for whatever adventure you may find yourself on. For something more on the classier end to finish off this getup, introduce a pair of Munro Lexi Boot from Nordstrom to the equation. This casual combination of a grey shearling jacket and black skinny jeans is extremely easy to throw together in seconds time, helping you look awesome and ready for anything without spending a ton of time combing through your closet. And if you want to immediately lift up your look with a pair of shoes, why not complement your ensemble with black leather ankle boots? For chic style without the need to sacrifice on practicality, we love this pairing of a red plaid coat and blue skinny jeans. Want to go all out in the footwear department? Complement your getup with a pair of Munro Lexi Boot. Try pairing a black silk sleeveless top with navy skinny jeans for a neat outfit. Complement your look with Munro Lexi Boot from Nordstrom to make the outfit slightly more elegant. A red poncho and charcoal skinny jeans are among the key pieces of a great off-duty sartorial collection. For something more on the dressier end to finish off this outfit, complete this ensemble with Munro Lexi Boot. If you're seeking to take your off-duty fashion game to a new height, go for a white shirtdress. And if you need to instantly glam up your ensemble with shoes, introduce a pair of Munro Lexi Boot from Nordstrom to the mix. A grey coat and a black pleated maxi skirt combined together are such a dreamy getup for fashionistas who appreciate relaxed getups. A pair of black leather ankle boots easily dials up the style factor of this ensemble.